Today marks the point in Earth’s orbit where it is closest to the Sun, known as perihelion. It might seem odd for those in the northern hemisphere for this to occur in the middle of winter, but that’s because the seasons are due largely to the tilt of Earth’s axis relative to its orbital plane. The variation in Earth’s distance from the Sun is minor in comparison, because Earth’s orbit is almost (but not quite) a perfect circle. 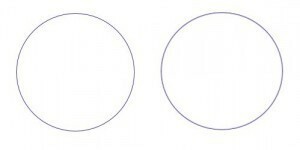 A perfect circle (left) compared to Earth’s orbit (right). The difference between perihelion (closest to the Sun) and aphelion (most distant) for Earth is just under 5 million kilometers. That’s quite a distance, but it is only about 3% of Earth’s average distance. Treating Earth orbit as a perfect circle is actually a good approximation. The same is true for the other planets, which is part of the reason why the whole “orbits are circles” idea of early astronomy lasted as long as it did. Of course that raises the question as to just why planetary orbits are so nearly circular. There are likely several factors that played a role in forming circular orbits. One is that as early protoplanets form, more elliptical orbits would tend to cross the paths of other bodies, and collision with them would tend to produce more circular orbits. Then there is the fact that large planets such as Jupiter tend to form early on, and their gravitational influence will tend to clump smaller bodies into groups. It could also be due to orbital resonances between smaller bodies, which would tend to stabilize orbits. Then there are effects such as the Kozai mechanism, when tend to align orbits into a common plane. Then there is the fact that circular orbits are more stable against gravitational perturbations than elliptical orbits. As we’re learning from computer simulations, the dynamics of solar systems are quite complex. But simulations do show that nearly circular orbits are quite common, and studies of exoplanets also show nearly circular orbits in many cases. So it seems that throughout the universe circular orbits are a good approximation for planets. But it isn’t exact, which is why we can celebrate today as our closest day to the Sun. It also happens to be Isaac Newton’s birthday, which is perhaps fitting given his work on planetary orbits.